Massu beat Lapentti, Kiefer lost, Chardy won, Davydenko cruised, and Kohlschreiber and Simon lost. Canas won, Verdasco won, Melzer won and Starace lost. 15 year old Diyas beat the flailing Kvitova to advance to a quarter final in her first tournament, Benesova won, Bondarenko the Lesser kept rolling and Vogele lost. Rus lost, Errani beat Mayr and Schnyder and Shvedova cruised. 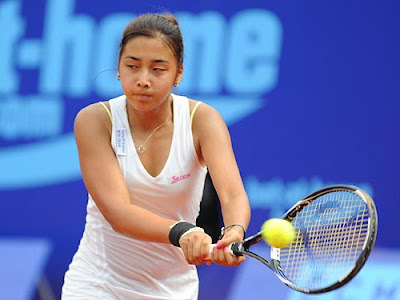 Zarina Diyas is from Kazakhstan which has been busy importing players (Karatantcheva, Shvedova, Voskoboeva) to bolster their beleaguered stocks now ironically they actually have a top home-grown prospect. The 15 year old wild-card has now won two matches (Mladenovic and Kvitova) and will play Benesova next. Richard Gasquet’s vindication in all its gory details.